The Karen Health and Welfare Department, a health service provider under the Karen National Union is planning that its teaching hospital, near Kawkariek will be set up and running by January, 2017. The teaching hospital, called Taw Nor [Daw Na], was planned to open on the first of January, but it is thought that unfinished building works might delay the official opening closer to the end of January, 2017. Padoh Saw Eh K’lu Shwe Oo, the department head of the KDHW said the Taw Nor teaching hospital was made possible by support from donors from Canada. “We planned to open on the 1st of January, 2017. But construction delays to some buildings have delayed us, but we plan to open before the end of January,” Padoh Saw Eh K’Lu Shwe Oo told Karen News. Padoh Saw Eh K’Lu Shwe Oo said that when the Taw Nor teaching hospital, built in Nan Shwe Mon village, is finished, the KDHW will administrate and provide healthcare services. The health workers trained by the KDHW will be given practical training at the new hospital, Padoh Saw Eh K’Lu Shwe Oo added. The KDHW estimates that the hospital will provide healthcare services to as many as 10,000 villagers living in the the area. KDHW said that the hospital will help prioritize the training of health workers from locations where more basic medical health-care services are needed. The construction of the 25-bed hospital began in March, 2015, supported by the Global Neighbors Canada Inc. and individual international donors at a total cost of 16 million Thai Baht (around USD $4.5 million or over 500 million Kyats). Saw Mya Aye,a villager from Ywa Tan Shay village that is close to the newly built hospital spoke to Karen News. 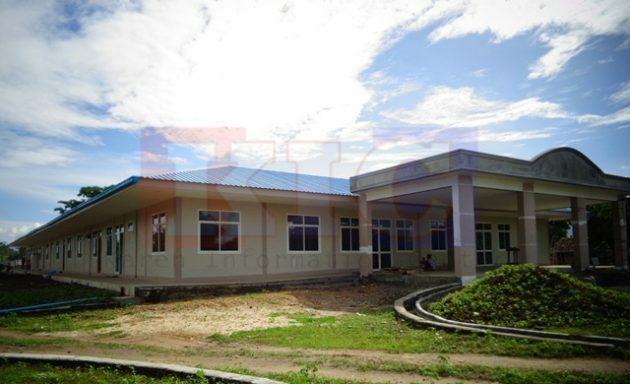 The Taw Nor teaching hospital is the first hospital to be built in a KNU controlled area. According to information from KDHW, another similar hospital is planned to be built in either the KNU Papun District or in Pa-an Distirct.